I actually saw this movie twice. I had an intense reaction during my first viewing and I didn’t know why. But I waited, let the film ruminate in my mind, and saw it again. It was during my second viewing that I understood why I had such an initial negative reaction. The film may be about a young woman from a lower middle-class family attending an expensive Catholic school in Sacramento on a scholarship, but the film’s themes are all-encompassing, crossing all boundaries and cultures. Lady Bird excels at exhibiting the pivotal milestones of any American teenager, like smoking weed for the first time, trying to fit in with the cool crowd, first loves, broken hearts, school dances, etc. Even more so, if, like me, you came from a lower middle-class family and had a strained relationship with your strong-willed mother. If you’re an American and went to high school, chances are you can relate to this film, no matter your socioeconomic class, gender, or race. 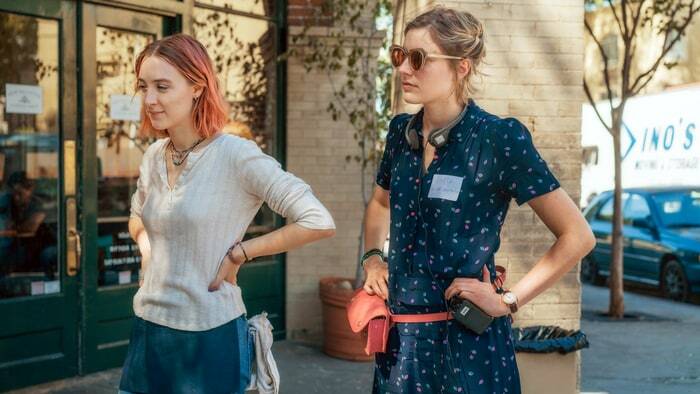 Greta Gerwig, the film’s writer and director, spent years writing Lady Bird’s script, which once stretched to 350 pages (Erbland). I’ll be damned if her hard work didn’t pay off brilliantly. It helps that the film is semi-autobiographical (Erbland). Like the film’s lead, Christine “Lady Bird” Mcpherson (Saoirse Ronan), Gerwig grew up in Sacramento, attended Catholic school, and bolted to New York City as soon as she graduated (Erbland). The story may not be Gerwig’s own to a tee, but its so deeply personal and expertly told that you can’t help but make the connection. As a testament to the great writing at play, much of the humor arises from well-defined characters reacting to everyday experiences, just like in King of the Hill (see I brought this review full circle). The casting of Lady Bird is phenomenal. All of the actors in the film feel and talk to each other like real people, even the small supporting characters like the teachers at the Catholic school are memorable, unique, and imbued with layers of depth that’s so sorely missing in most big budget films today. The rest of the supporting cast is obviously fantastic, such as Lady Bird’s loyal best friend (Beanie Feldstein), her pretentious boyfriend (Timothée Chalamet), or the popular girl that everyone wants to befriend (Odeya Rush). You may think “this sounds like any cliché coming of age film I’ve seen before,” but it is most definitely not. Gerwig originally titled her script Mothers and Daughters and it’s very easy to see why (Zuckerman). Lady Bird is anchored by the two standout performances of Saoirse Ronan and Laurie Metcalf, who play Lady Bird and her mother Marion McPherson, respectively. Their performances and relationship are the solid bedrock upon which the rest of the film is built. Lady Bird is just a regular teenage girl with big glorious dreams of owning a beautiful house, going to a fancy college on the east coast, and escaping Sacramento, which she can’t seem to stand. She is extremely confident and at the same time incredibly insecure and naive. “I want to live through something,” she says, exasperated, completely unaware of the dramatic and devastating War on Terror beginning in her life’s periphery. She wants to do something with her life and be someone, she just doesn’t have an idea of what that something is just yet. Lady Bird’s unrealistic dreams, innocence, and naivety are juxtaposed brilliantly with the realities of the harsh, uncaring world her mother wants her to be ready for. Marion wants Lady Bird to be realistic, to be “the best version of yourself that you can be.” Lady Bird’s grades aren’t that good, her brother can barely find a job despite graduating from Berkeley, and her father has lost his job. Life is difficult for Marion and the McPhersons. They are barely scraping by and Marion is the adhesive holding them all together. The film implies that Marion’s entire life has been a struggle. All the while, Lady Bird, Marion’s only daughter, seems ungrateful for everything Marion has done for her. Tough love is an understatement of Marion’s parenting style. To quote the film, Marion is “warm, yes, but scary.” And yet, behind the tough wall she puts up, Marion is warm, sweet, caring, and very sensitive about her family and their station in life. Most of the film’s themes revolve around this mother-daughter pair and they have such believable chemistry together. And that’s what Greta Gerwig has done, she has brilliantly showcased “the truth of ordinary life” that’s uniquely personal yet effortlessly universal. Despite this being her first feature film, Gerwig confidently showcases her skills with the aplomb of a seasoned veteran. The travails and triumphs of high school, the nostalgia and love Gerwig has for Sacramento, and, of course, the strained and complex relationship between a mother and her daughter. The film’s ending, a mix of sad realization and bittersweet achievement is simply punctuated by a name. Funny, heartfelt, moving, well-written, deftly acted, and beautifully shot, in short, Lady Bird is fantastic, what more is there to say? Ebert, Roger. “Dead Presidents Movie Review & Film Summary (1995) | Roger Ebert.”RogerEbert.com, Ebert Digital LLC, 4 Oct. 1995, www.rogerebert.com/reviews/dead-presidents-1995. Erbland, Kate. “Greta Gerwig Explains How Much of Her Charming Coming-of-Age Film ‘Lady Bird’ Was Inspired By Her Own Youth.” IndieWire, Penske Business Media, LLC, 6 Oct. 2017, www.indiewire.com/2017/10/greta-gerwig-lady-bird-inspired-by-youth-1201884532/. Zuckerman, Esther. “How Greta Gerwig Turned the Personal 'Lady Bird' Into a Perfect Movie.” Rolling Stone, Rolling Stone, 6 Nov. 2017, www.rollingstone.com/movies/features/how-greta-gerwig-turned-the-personal-lady-bird-into-a-perfect-movie-w511093.